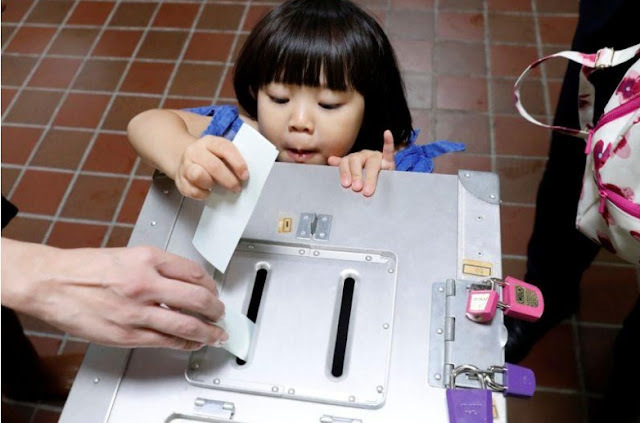 A girl casts her father's ballot for a national election at a polling station in Tokyo, Japan October 22, 2017. TOKYO - Japanese voters deliver their verdict on Prime Minister Shinzo Abe’s nearly five years in power in an election on Sunday that could give him the clout to push ahead with his cherished goal of revising the post-war, pacifist constitution. Media forecasts show Abe's gamble on the snap poll is likely to pay off, with his conservative Liberal Democratic Party-led coalition closing in on the two-thirds "super majority" it had in parliament's lower house before dissolution. A hefty victory would raise the likelihood that Abe, who took office in December 2012 promising to bolster defense and reboot the economy, will win a third term as LDP leader next September and go on to become Japan’s longest-serving premier. It would also reenergize Abe’s push to revise the war-renouncing constitution by clarifying the status of the military, while maintaining his “Abenomics” growth strategy centered on the Bank of Japan’s hyper-easy monetary policy. The constitution’s Article 9, if taken literally, bans the maintenance of armed forces. But Japanese governments have interpreted it to allow a military exclusively for self-defense. Backers of Abe’s proposal say it would just codify the status quo. Critics fear it would allow an expanded role overseas for the military. The LDP’s junior partner, the Komeito, is cautious about changing the constitution, but media have forecast that the LDP and pro-revision opposition parties are on track for the two-thirds majority needed to begin to change the charter. A weak LDP showing, however, could trigger moves to replace Abe when his term as party chief ends, and cloud the outlook for amending the constitution. Abe, 63, has already led the LDP to four landslide wins since he took the helm of the party, but turnout has been low and the LDP has typically won with about 25 percent of eligible votes. Others either stayed home or backed opposition parties. This time, Abe said he needed a new mandate to tackle a “national crisis” from North Korea’s missile and nuclear threat and a fast-ageing population. He called the poll amid confusion in the opposition camp and an uptick in his ratings, dented earlier in the year by suspected cronyism scandals. Abe has backed U.S. President Donald Trump’s tough stance toward Pyongyang that all options including military action are on the table. Trump is to visit Japan Nov. 5-7 to reaffirm the leaders’ tight ties. “The situation in the world is not stable in many aspects and I believe the LDP is the only party to rely on,” 78-year-old Kyoko Ichida said after voting in the capital. As voters went to the polls, powerful Typhoon Lan was dumping heavy rain on much of Japan, threatening to lower turnout. Voting ends at 8 p.m. (11:00 GMT) and media issue exit polls thereafter. Final official results will be early Monday morning. Abe’s move had seemed risky after Tokyo Governor Yuriko Koike, often floated as a possible first Japanese female premier, launched her conservative Party of Hope. The Party of Hope absorbed a big chunk of the failed main opposition Democratic Party. But voter enthusiasm soon seemed to wane despite its calls for popular policies such as an exit from nuclear power and a freeze on a planned sales tax rise. Koike is not running for a lower house seat herself - she will be in Paris for a climate change event on Sunday - and has failed to say whom her party would back for prime minister. Fish wholesaler Kazuo Takeguchi, 71, said he had had hopes for Koike’s party but was disappointed when she decided not to run. Instead, he voted for the Japanese Communist Party, in part because of the cronyism scandals that had eroded Abe’s ratings. “I can’t help wonder if you are entitled to do whatever you want to if you are sole strong party,” Takeguchi said. “I want some party to emerge as a force to defeat the LDP,” he said, adding, however, that the JCP was unlikely to play that role. A new Constitutional Democratic Party of Japan (CDPJ), formed by liberal DP members, is now vying with Koike’s party for the top opposition spot, though both will have just a sliver of the LDP’s presence if forecasts prove accurate. Japanese voters deliver their verdict on Prime Minister Shinzo Abe’s nearly five years in power in an election on Sunday that could give him the clout to push ahead with his cherished goal of revising the post-war, pacifist constitution.